Ho Chi Minh City is to start using information technology a lot more. This modern method will make it easier to run the city. City workers will be able to communicate with one another more quickly. They will also be able to find documents and records far more quickly. It will hopefully make the city work more efficiently. HCM CITY (VNS) — HCM City has increased the use of information technology in public administration, helping usher in e-governance, according to a Government report. Vo Thi Trung Trinh, deputy director of the city Department of Information and Communications, said the administration, districts, departments, and corporations had been connected to a single system, and meeting invitations were sent through email, smart phone and SMS and meetings were held securely online. All 24 districts had installed the same software programmes, she said. So far more than half a million documents had been sent electronically from 177 offices, she said. In 2016-20 the city would set up an e-office to manage administrative operations and offer online public services to the public and businesses. The city would also integrate and link all its administrative units. But Trinh admitted that some problems existed with online payment of fees for public services due to the lack of a legal framework for such payment. To handle problems, the Department of Information and Communications had improved the website http://dichvucong.hochiminhcity.gov.vn on which many online activities could be done. Tran Thi Binh Minh, deputy director of the Department of Planning and Investment, said her department also provided public services in areas like land, business-related issues, and investment promotion online. Hong Van Hai, head of the Judicial Department's criminal record section, said the judicial and information and communications departments were jointly working on a pilot software programme to verify the birth, death and marital status of citizens. The programme, to be tested next year, would help cut the time needed for people to apply for a criminal record certificate. At a recent meeting on e-governance held in the city, Nguyen Quang Trung of the HCM City Open University said there were three essential elements in the success of e-governance: government management capability, information and communications technology infrastructure and human resources, and local conditions. Government capability includes leadership, funding for project deployment, e-governance development strategy, capacity of project managers, and legal framework, according to Trung. Infrastructure refers to computers, mobile devices and the internet, but a lack of public familiarity with computers is a major hurdle. "Age, ability to use computers, internet availability, and locations will affect the success of e-governance," Trung said. "E-government projects should get the highest priority with respect to focus, funds and human resources and should take advantage of international support." Le Doan Hop, a former information and communications minister, underlined the need for e-governance, saying, "All public requirements can be fulfilled by the Government without meeting face-to-face, and it will prevent corruption." "Though it has been in the works for a long time, in Viet Nam e-governance remains in a fledgling stage compared with elsewhere," he said. "The country's e-governance system should link the central government with communes, businesses and people. Viet Nam should use international models like those used in Israel and Singapore," he said. In a 2014 UN survey, Viet Nam ranked 99th out of 193 countries in the E-Government Development Index, and 26th out of 47 in Asia, though ranking ahead of Malaysia and Thailand. The survey was based on three components: online services, telecom infrastructure, and human resources. HCM City has increased the use of information technology in public administration, helping usher in e-governance, according to a Government report. E-governance means governing through the Internet. To usher in e-governance means to introduce this form of governing. Online means connected to the Internet. In 2016-20 the city will set up an e-office to manage administrative operations and offer online public services to the public and businesses. An e-office is an office that may not exist in a building but exists in the sense that people communicate with one another through the Internet, or electronic media. The city will also integrate and link all its administrative units. If a city integrates all its different offices where administration is carried out, it brings these different offices together to become one. Public services are things that the State provides for people, such as clinics, schools, garbage collection and other things. A legal framework is a whole lot of laws that must be obeyed by anyone who wishes to perform certain things. They are also in place to protect people. Investment happens when people put money into projects in order to make more money from those projects. Investment promotion is saying good things about such projects to make investing in them sound like a good idea. A criminal record is a record of any crimes someone may have been guilty of having done. A pilot software programme is a small software programme that is done to see if it will work. If it does work, it may be made into a bigger programme that is carried out. To verify means to confirm. Your marital status is whether you are single, married, divorced, a widow or a widower. Human resources are people who work for companies and are therefore worth something to those companies. Something that gets highest priority is at the top of the list of things to be worked on. To take advantage of international support means to make use of it so that it helps you. A former information and communications minister is someone who was once an information and communications minister but is no longer. Corruption happens when people who have a little or a lot of power demand that those who want their services should pay them extra money when, in fact, they are not supposed to receive extra money for giving out such services. 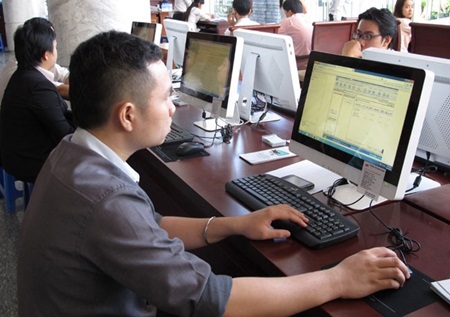 If Viet Nam e-governance is still in a fledging stage it is still young and undeveloped. 1. Tran Thi Binh Minh is head of the Judicial Department's criminal record section. 2. Nguyen Quang Trung is from the Ho Chi Minh City Open University. 3. The pilot software programme was tested last year. 4. So far more than a million documents have been sent electronically from 711 offices. 5. Viet Nam e-governance is at a very advanced stage compared with other countries. 1. False; 2. True; 3. False; 4. False; 5. False.